Bought used in 2009 for $20 CDN in mint shape... Was looking for a portable music device that could power my Sennheiser HD580's adequately (which my iPod nano couldn't) AND plug in to other stereo devices. Built when sound and construction quality was visibly and clearly still a high priority for SONY (and I'm sure to justify the relatively high price at the time). Slim, elegant (except for clumsy add-on battery pack - however takes AA's, which I estimate will be available FOREVER). Combination line/optical AND headphone output (try finding that on a new player). Sound is excellent... smooth extended frequency response... lots of detail. I run it 'flat' and don't use the bass adjustments... but agree with others that they don't provide much adjustment. Original batteries were dead, but I use it with the A/C adaptor (and found a second one used for $5 - to keep at work) or the AA adaptor. Buy one if you find one - you won't regret it! A good product. The megabass either provides much too much bass on level 2 or not enough on 1. That's okay though, it has good sound. The remote isn't backlit, but that's not a problem for me. The external battery case and the remote provide too many cords, and they make this sleek little package turn into a tangled mess. But all in all, it's a great product. I LOVE it. It isn't the best I've used, but it is up there (as you can see, I've used many). -Slim design -Awesome Remote -Rechargeable "gum" batteries -carrying case -Sony quality! -Doesn't skip... EVER! -Looks sweet! -The price.. i got mine for almost 30% off! Sony's quality. They invented the walkman and still no other company makes them better. It won't break on you (providing you take decent care of it). volume control doesn't extend loud enough. Stocko earphones that come up with it are crap. Go out and buy a decent pair (Sennheiser Headmax etc). The 80hr battery life is marketing scam -a lie. This review is for what I assume to be the model below: DE-J725. It might even be a later model. Mine comes with a backlit remote, cloth carry bag and a claimed 80 hr battery life. Yeah right! A decent pair of alkalines will give you half that figure. The rechargeable NiCd batteries that Sony gives you - half that again. If you're lucky. 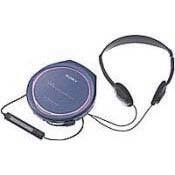 I'm not a real fan of discmans generally speaking but as I'm still a student, I require some form of portable sound. I have now owned a total of 5 models from Sony (2 have been stolen, 2 wore out). The DE-J725 is unbeatable value. Sound aint the voice of god (it's a portable), but it sounds like it's designed to which for a discman is absolutely fine. Compared to other manufacturers, Sony needs more sound tweaking controls, not just BASS 1 and 2 settings which do virtually nothing. The G-protection anti skip works well enough. Sony **thinks** you can jog with this thing. You cant. But if you want to be the designer yuppy gym junkie jogger - buy a minidisc instead. Only ever used Sony portables. small size, digital copying using the optical output, rechargeable batteries. Joystick has no back-lite, I can''t read it in the dark! Limited control without the joystick. SONY CD players, heavy with AA batteries. they said it was gum battery, but i bet if you put gum in the cd player it would not work. its just sugar, come on guys! Few buttons on machine. Need nore tone options next time Sony! This is a great little CD player, the remote contol keeps everything tidy, but the wires are too long with it attatched using anything but the supplied headphones (which are very short). But it has an excellent sound, battery life and anti-skip system. The only thing sony need to put in the portables not is an EQ system (only two settings of mega bass was dissapointing, just leaving it on one is the only real option to get a good sound) But overall a good buy. Especially if you got it at the bargain price i did (£85)!